The buttons listed on that graphic can have their functions swapped around with others, but not all buttons can be remapped; most notably, the item selection and aiming fuctions cannot be changed. The buttons with such fixed actions are coverd below. 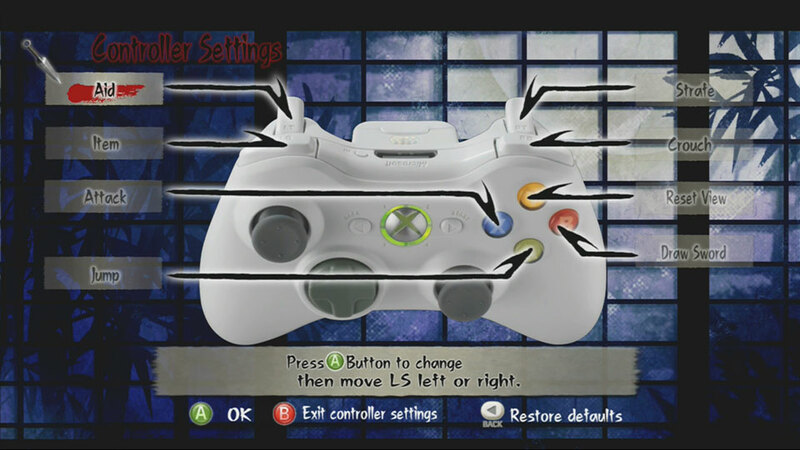 To modify your control scheme, go to Options>Control Settings>Controller Settings. Fairly self-explanatory and common use of the button. You can restart the current mission here, or quit out to the ninja village or mode select. This is useful to know for routing and/or testing more so than running. Pressing the button during a mission brings up an overlay of the map. While it isn't wildly accurate and typically doesn't show much information, it is critical to use in bomb retrieval missions, such as Mission 45. You can move and act normally with the map up, and overlay is somewhat transparent, but it can be difficult at times to see where you're going. This is an action you can rebind in the Control Scheme window, but it isn't quite as useful as it initially seems. While the function is called Reset View, it only resets the camera's Y-axis (vertical position). It does not face the camera where your character is looking; instead, the is responsible for this action. By default, Reset View is bound to the button. You can change which item you have active by pressing left or right on the D-Pad ( ). Upon entering the mission, the Grappling Hook will be selected by default, regardless of any other items you have equipped. You can aim your currently selected item by pressing down on the stick. If it can be aimed, a targeting reticle will appear. Many items do not require aiming or cannot be aimed at all, such as Vanish or Dazzle. However, items such as the Grappling Hook require aiming before being used, and others are most effective when aimed ala Blowguns. While in front of a door (aka shoji), using this imput will instead peek through the door. This is very useful for surveying a room, but more importantly enables you to open a door with your sword drawn. This comes up huge in Missions 27 and 48. This is another action that can be rebound, but since the game simply calls it "Item", some extra explanation for clarity is in order. By default, pressing the will use/activate your currently selected item. As mentioned previously, the Grappling Hook requires aiming before it can be used. The Ki Meter, sometimes referred to as the Lantern, is the most useful part of the HUD in this game. Its most basic function shows the player the status of nearby enemies and whether or not the player has been detected, and has a variety of other states. It glows a different color depending on whether or not you're detected, or if an enemy is in a search mode, sees something suspicious, on-alert, smells you, or actively sees you. By default, it glows green, indicating that you haven't been noticed, and displays a number next to it. This number is a proximity indicator that displays how close you are to an enemy character, with the number getting larger the closer you are to the enemy. - Curious. Triggered by nearby noise. The enemy will stop in place and begin turning towards the source of the sound. No heightened detection. - Suspicious. Triggered by being seen near the edge of an enemy's vision range. Enemies in this state will slowly walk towards where they saw you and have slightly higher detection. - Smell. Triggered by being near a guard while afflicted by a distinct odor (blood, cesspool, stinkbomb, etc). Similar to Purple mode. - On Alert. Triggered by certain noise thresholds and finding bodies. You cannot Stealth Kill anyone who is in this mode. Enemies have much higher detection capabilities. - Detection. You've been detected and most enemies in the immediate vicinity are fully alert and will try to kill you. You cannot Stealth Kill any enemy who is in this mode. Of these Meter states, Green and Purple are typically the best. Green allows you to scout for enemies who aren't in line of sight with the proximity number, while Purple mode stops enemies and civilians in their tracks, delaying their regular cycle. It is also used to distract guards into looking in a direction that allows for otherwise impossible Stealth Kill strats, such as Mission 17 or Mission 26 in the Any% Ninja 5 category. Physical Abilities are Tenchu Z's values for the ninja's base stats. A ninja has a Vitality, Strength, and Agility value between 0 and 100, with the maximum limit increasing periodically throughout the game: 150 maximum after completing Mission 17, and increased again to the hard cap of 200 upon completing Mission 37. Sound in Tenchu Z is a bit quirky, to say the least. There is a Sound meter on the left of the Ki Meter that indicates how loud you are currently, with the idea being that too much noise will alert nearby guards of your presence to varying degrees. This meter can be inaccurate, with some movements like the R-Dash seemingly looking as loud as running, yet has the pratical effect of catching the attention of nearby enemies in a surprisingly large radius. The Ninja ratings in Tenchu Z are tied directly to the amout of points scored in the mission. While the Any% category doesn't mandate any specific rating, Ninja 1 ratings are avoided as much as possible. This is due to the longer unskippable cutscene that accompanies this rating taking nearly five seconds longer than other ratings. For Any% HN5, a Ninja 5 rating is required for any mission played. The next section will break down how the game calculates these point totals. Upon completing a Mission, you will be given a score based on various criteria and given Gold equal to your score. Note that these Bonuses are listed in the results screen as "Specials", and can be viewed by pressing the . The most basic form of movement, controlled by the Left Stick. The speed of the run is dictated by the Agility stat of your character. Note that an Agility stat less than 150 is slower than R-Dashing. The fastest stealth movement in the game. Rolling in Tenchu Z is treated as a silent movement regardless of terrain and reduces your visibility significantly. It is also impossible to bonk into walls or other obstacles while rolling. Despite it being the fastest stealth movement in the game, it still ends up being slower than running and R-Dashing. In cases where silent movement isn't required, use those movement options instead. A normal jump by pressing . The momentum can be affected by stick input. This jump without stick input is referred to as a Neutral Jump. Holding the and moving in any direction allows you to slowly move in that direction. This is primarily useful for adjusting positions for precise Dashing sequences on narrow walls, such as the one in Mission 8. The fastest ground movement under 150 Agility. Press forward and while holding down the to Dash. This is the primary means of movement pre-Mission 45. While faster than rolling or running, it is also significantly louder in-game, which can be a detriment when dashing near enemies. This audio property is sometimes used advantageously to put certain key guards and bosses in Purple Ki mode. Holding the and jumping with a left or right input will sidehop in that direction. Fairly slow and not currently used for anything. Same as above, but with a back stick input. It covers ground fairly quickly, but has a hefty recovery time. What the game refers to as a Moonsault, this techinque is performed by pressing + with no stick input. Perhaps the greatest benefit of this technique is the very quick landing recovery. This allows you to scale succeptible walls and almost immediately continue onwards upon landing. There are parts of the route that use R-Jumps to get over or onto certain walls and take advantage of the low recovery frames, such as Mission 8 and Mission 9. Note that the is also responsible for facing the camera forward, so try to just tap this trigger when executing this jump. Otherwise, your camera will face the direction of your character during the twist and end up in the reverse direction of the beginning, which can be disorienting. L-Jumps are the fastest jumps in the game. They can cover a decently large amount of aerial distance fairly quickly, and the landing recovery can be canceled into a Dash or Roll. + executes a basic L-Jump, with stick input modulating the momentum of the jump. A Stealth Kill, typically shorthanded as SK, is the primary mechanic used to eliminate enemies. An SK is a one-shot kill, allowing quick disposal of enemy combatants, including most mission targets. An enemy cannot be SK'd if they are certain Lantern Modes, namely, Blue Flame and Red Flame modes. The only enemies who cannot be SK'd are Shigi and Nagayori, due to the fact that they are always in Blue or Red Flame mode. An SK is performed by pressing the button near an enemy with the sword drawn while the Ninja Seal is circling the target (there is also heartbeat audio). Depending on various factors such as your stance as well as your positioning relative to the target, you will perform a specific SK. In a speedrun, certain SKs are favored over others, with some strat relying on performing specific SKs on critical targets to complete a level optimally. A standard SK that occurs when approaching from the front of the target. The Front SK is fairly slow, involving flipping the target over before executing. Given that the angle of approach for this SK to occur is very risky anyways, it probably will be one of the few viable SKs when charging an enemy. A standard SK that occurs when facing the back of an enemy. This is the fastest standard SK due to simply grabbing and stabbing. Aside from the non-Seal SKs, the Back SK is probably the fastest SK in the game, allowing a quick cancel to boot. When executing an SK from the right of the target, you will grab the target briefly and slash diagonally downward, throwing the body right and slightly behind you. It is a fairly quick SK and doesn't lose too much time compared to faster methods. When executing an SK from the left, you will shove the target, filp them over you, then snap their neck. This SK is very slow and should be avoided in virtually all situations. By performing an SK while crouched, you flip the enemy over and execute. This is faster than most SKs involving flips, but it is still fairly slow. If you grab an enemy, you can either knock out or SK them. The SK stabs twice fairly quickly, with the downsides being the long recovery and that you need to invest the time to grab the enemy in the first place. It does have the benefit of going into the grab with an unsheathed sword and coming out of the SK with a drawn sword. An Aerial SK occurs when you SK a target while you are airborne. This SK will snap you directly behind the target if you're facing the target's back, and will turn the target around if approached from the front. The main benefits of this SK are to avoid Uneven Terrain SKs and the swiftness of conversion to a Consecutive SK. A Shoji SK is a stealth kill that stabs the target through a shoji, or sliding translucent door. This SK is done by pressing the X button in front of a shoji while a target is close enough to the shoji on the other side. Shoji SKs can be done on moving targets, but since proximity is a crucial factor, the window in which to SK is greatly reduced. The primary benefit of the Shoji SK is the fact that you can kill an enemy in a room without actually opening the door, which eliminates the possibility of being seen by the target. Additionally, opening a door in Tenchu Z is actually rather clunky if the sword is drawn; you must peek into the room by clicking the Left Stick in while adjacent to the door, then press the X button to slide the shoji open, then run into the room and SK. Because of how time-consuming and finicky this can be, Shoji SKs are a much cleaner and faster way of dealing with certain room-dwelling enemies, such as the Mission 1 and Mission 2 bosses. While most SKs involve pressing while the seal is showing, there are a few SKs that bypass these SKs and their subsequent animations entirely. Namely, the Slash SK, R-Dash SK, and Aerial Slash SK all avoid the usual animations of SKs and allow very quick dispatching of enemy combatants. By pressing while airborne, you will slash in a arc forward. If executed correctly, you can Slash SK enemies while in a jump. The timing for this tech is pretty tricky on its own, but is compounded by the awkwardly small hurtbox produced by this slash. The landing recovery is also quite slow, which pushes this method to fringe case use. Currently, only Mission 26 sees common use of this technique. By pressing while executing an R-Dash, you will stab forward. This technique behaves similarly to a Slash SK, has the longest effective range of all SKs, and is ideal for getting an SK over a greater distance. The primary downsides are the very narrow hurtbox and the longer than average recovery animation. Note that an R-Dash SK will toss the target forward quite a distance, so keep this in mind for level that require more precise body placement. A Consecutive SK is performed by pressing the button while another SK is being performed if there is an appropriate adjacent target. The Ninja Seal will flash breifly when this technique can be executed. The timing between the different SKs varies, with a Back SK seemingly having the most lax timing and SKs such as Left SKs being very tight. Generally, we just mash the button upon beginning the inital SK. The example below shows an Aerial SK linked into a Consecutive SK, which also demonstrates how quickly Aerial SKs can be converted into Consecutives. An SK performed while sidling a wall. Currently has no use in any speedrun route, since it is generally slow and has a short kill range. An SK that can be used while hanging off of a ledge under an enemy. Currently has no use in any speedrun route. A unique type of SK that can only be used in conjuction with a special ceiling technique that can be bought in the shop. Currently has no use in any speedrun route. Combat conducted outside of stealth is fairly clunky in this game. Unlike Stealth Kills, which are very fast and efficient, engaging in a sword fight is time-consuming and largely inefficient. Pressing the Button will slash your sword, which is intended as the bread and butter method of fighting bosses. The primary use of slashing in speedruns is for Slash SKs as mentioned in the previous section. Additionally, slashes can be used to quickly move through doors by cutting through them. By default, the Triple Slash will be equipped to your character, performed with three button presses. The first and second slashes can be cancelled into another Triple Combo ad nauseum, but the timing is quite strict. This can be used to great effect when brawling Nagayori on the final stage. Alternatively, doing two full Triple Slash Combos consecutively will break through an enemy's block, which can be very useful. There is a Quad Slash available in the game, but it is currently unused. It replaces the Triple Slash Combo with four slashes in quick succession that do less damage and have much lower range. Because this makes Slash SKs much worse, the default Triple Slash is preferred. Aerial Slashes are performed by slashing the sword while airborne. They are currently only useful for Aerial Slash SKs. Their hefty recovery time and difficulty of use relegates them to niche strats and aren't commonly used. While fighting an alerted enemy, you can lock on to them by holding down . It can be very useful in Mission 50, but otherwise doesn't see much use. Holding and will put you in a defensive stance. It can be broken with too many heavy attacks from enemies, but can be very useful for blocking one string of attacks. The default item that is always equipped, the Grappel Hook allows you to zip up to high ledged and rooftops. It can be used both on land and in water, but cannot be used while airborne. The Grappel Hook cannot be used offensively, and only serves as a utility tool. The Shuriken is a ranged throwing star. It does mediocre damage and is very underwhelming in combat. In a speedrun, Shurikens are instead relegated to a utility role. Specifically, in Mission 16, we use Shurikens to tactically alert Echigoya at specific spots in his cycle. Throwing this item near Echigoya immediately puts him in Blue Ki Mode, causing him to be alerted at run along his set path. This hurries up what essentially was an auto-scroller, and saves a huge amount of time. Click Here to see this strat in action. While other items can have similar effects on that mission, they aren't as precise. Also, a new game file has 5 Shuriken available from the beginning, thus securing Shurikens as a staple item in the various Speedrun routes. The Vanish item renders the user invisible after a slight delay. Primarily designed for running past guards without detection and setting up a critical Stealth Kills. The effect dissipates after about 15 seconds or if you SK an enemy. However, non-standard SKs such as Slask SKs and Dash SKs DO NOT break the invisibility effect. This means that, within the duration of the Vanish, you can SK without limit assuming you use those SK types. You can learn more about this glitch in the Vanish Slash SKs tab, under the General Technology section, by clicking here. Blowguns are arguably the most powerful item in the game, in contention with Vanish. Blowguns are a ranged weapon that one-shot any non-alerted enemy struck, including bosses. They can auto-target, have a huge effective range, and fire silently. This allows for far more efficient Elimination Missions (46 and 48) as well as the occassional level cheese (Mission 36 in Any%HN5). The downsides are relatively minor. You can only equip five Blowguns at a time, they are somewhat slow to fire, and they tend to alert enemies near the struck target. Additionally, any enemy alerted or alarmed will not go down to a single shot, and will instead be poisoned. Regardless, the Blowgun is a staple item in all Speedrun categories due to its unrivaled power and range. The Burst Arrow is the only explosive used in Speedruns so far. This item fires an explosive fireball to the targeted area, doing decent damage. As usual with combat items, Burst Arrows are used for their utility instead of their damage. The primary benefit of Burst Arrows is their large knock-back, which enables a very effective Shigi drowning strat in Mission 50. The first Burst Arrow knocks Shigi down one roof level, then a second shot blasts him into the moat below, concluding the mission and the run very easily and safely. The Bow & Arrow is an item that fires a fairly slow projectile in an arc. A Bow cannot be purchased in the shop and can only be picked up by looting Archers. The Bow is relevant in Mission 16 of HN5 since it allows for no prior item equipment, saving roughly 7 seconds on its own. The Paralysis Cake is a seemingly underpowered item at first glance. If eaten by an enemy, they will become poisoned, taking periodic damage. The real strength of this item is the fact that enemies are automatically drawn to and are distraced by the cake. Guards will interrupt their routine cycles to pick up and eat the item. This is used in the start of Mission 48 to lure a normally stationary unit out of a house, allowing a quick Stealth Kill. All Stealth Kills have recovery animations, and most can be canceled to allow for earlier movement afterward. In all instances, holding down Crouch ( ) until you see your character begin to crouch, then releasing the bumper will cancel the recovery frames to various degrees. Only the Uneven Terrain SK cannot be canceled in any appreciable way. While an uncanceled Slash SK is faster than any standard SK, these slashes can be made faster yet. Slash SKs can be canceled with A-Jumps and any + Movement sequence. However, there are two special types of Cancels that extend beyond manual dashes. The X-A Cancel is a unique type of Slash Cancel performed by holding shortly after Slashing with . This will execute a seemingly frame-perfect R-Dash to cancel the Slash animation. If no stick inputs are applied, this R-Dash will always go in the direction the character is facing, regardless of camera position. An extension to the X-A Cancel, XAC Cancels stop the given Dash with a Crouch. This allows for very fast Slash SK conversions and allows for much more utility and safety. Holding along with shortly after Slashing with . Due to how quickly this cancel cycles, it is very possible to recover a whiffed slash by repositioning and attempting another Slash or Standard SK. While Vanish is active, you can retain the invisibility and SK enemies if non-standard SKs are used, such as Slash SKs or Dash SKs. See the later sections of Mission 46 or Mission 48 for examples of this exploit in effect, found by clicking here. It is possible to cancel a grappel by pressing the Use Item button while traveling. This stops your upward trajectory and does a small backflip back down. Largely useless at the moment. As it stands, there are no relevant Skills, Secret Arts, or Combos in any current route. This may change in the future, most likely when All Missions Ninja 5 is routed.